You can ignore the signs and numbers, you cannot even know about the power of their power over the fate of people, but this does not make their magical properties less. At all times, in many nations, number “seven” was considered happy and complete, the number full of energy and of higher spirituality. Many things in religions and beliefs of the people, in art and science, in language and culture are connected with it. The presence of the seven is felt at every step in the world around us. Remember, 7 wonders of the world, 7 basic notes in music, 7 colors of the rainbow, 7 days of the week, etc. Kazakh people also associate the number 7 with a number of titles, sayings (Zheti Yrys – Seven Lucks, Zhetі Zhargy – a Corpus of Kazakh Customary Law established by Tauke Khan in XVII century, Zhetі Galam – Seven Universes, Zhetі Ata – Seven Generations). But a special place in the ideology of Kazakh people is took by the concept of “Zhety Kazyna” – Seven Treasures. By treasure people mean the seven necessary components of life of a real human: yer zhіgіt, sulu jane akyl ayel, zhuyrіk at, kyran burkіt, zhuyrіk tazy, beren myltyқ, bilіm (masculinity of a young man, a beautiful and intelligent wife, a fast-footed horse, a hunting golden eagle, a faithful dog of the Tazy (greyhound) breed, good weapons, comprehensive knowledge). With these seven treasures life is full and happy. Why the first component of “Zhetі Kazyna” is “yer zhіgіt”? This is explained by the fact that a man was always the head of Kazakh families, nomads, he was an earner, a breadwinner, a protector of the clan. We say about women, wives: “Akyldy ayel – bereke bar” which means that an intelligent woman (wife) brings wealth into the family. The task of a wife is not just to keep the family hearth, but also to wisely allocate the bag brought by her husband to escape such situation when “stuff today and starve tomorrow”. Moreover, it is up to a woman to bring up children worthy of their father. The head of the family does not bring up the children – he is constantly at work, hiking, hunting. Mother instructs children to respect their father, to look at his deeds, to learn from him. That is why a beautiful companion of life should be according to "Zheti Kazyna" legendary tradition – akyl ayel (a smart woman). This is the happiness. By the way, do you remember the instruction of elders on necessity to know your ancestors up to the seventh generation? Seven again! Kazakhs have this "unwritten law" "Zheti Ata" (Seven Generations) that is still being passed over from generation to generation. Traditionally, Kazakhs have always been against the kinship marriages. In order to have healthy generation and to avoid genetic diseases, it is forbidden to be related to anyone up to the seventh generation. Today, high risk of mental and other diseases in children born in related marriages has been scientifically proven. Our ancestors acted so intuitively! 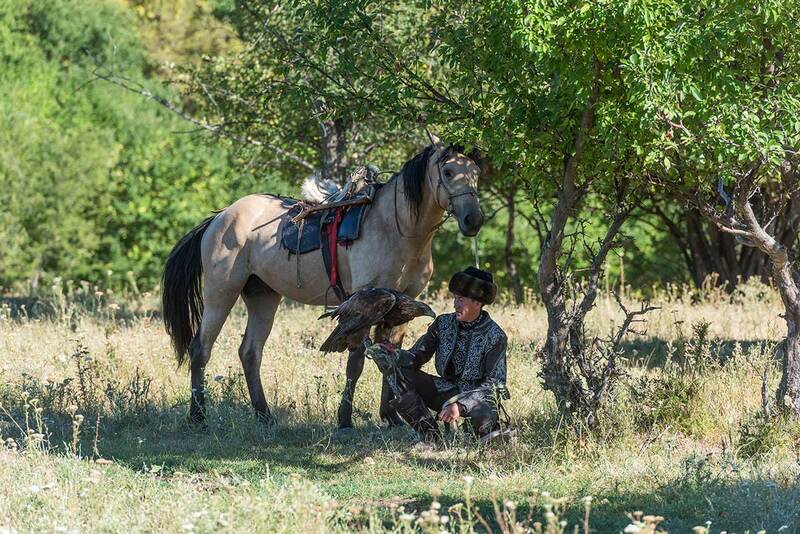 Three more treasures of a real man in the concept of nomads are three faithful friends of the jigit: a fast-footed horse, a tazy (greyhound), a hunting golden eagle. What could a man get with his bare hands? A natural predator, such as the golden eagle, is able to get hares, foxes, and even wolves! 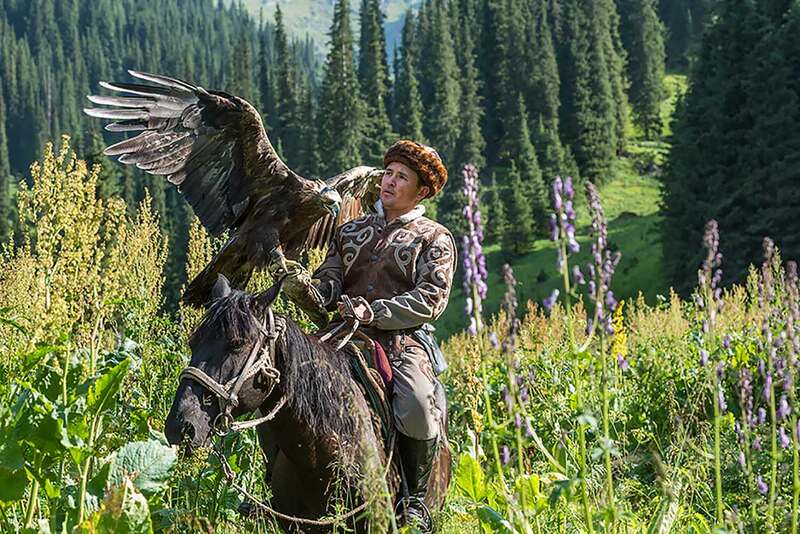 Moreover, the Kazakhs believed that the house, where a golden eagle lives in, is saved from evil. Therefore, the wings, feathers, paws of this bird were hung on the honor place or above the head of the cradle. It was believed that the sacred bird protects against the evil eye and damage i.e. serves as a talisman. ... Tazy dog was also a faithfull friend at the hunting. It is believed that with the advent of tazy puppy abundance, wealth and happiness come into the house. Nomads took care of puppies since birth, trained them and, when the puppies were ready, they were released to the beast. Taking the first prey with the dog was a real holiday. Tazy together with a hunting bird and a horse were always taken to large toi (celebrations) and festivals – they were a real pride of a man. In Kazakh oral folk art, a horse is an indispensable companion of a hero. People say “He is not a jigit if he has never sat on a horse”. Did you know that Central Asia and, in particular, Kazakhstan are considered to be the most likely place for domestication of horses? Even today, when these animals do not have such great significance for nomads as before, a large number of horses continue to be bred in Kazakhstan. Steppe horses remain an indispensable element of the cultural heritage and modern culture of the country. One of the most popular here is the local Kazakh horse breed. Animals of this breed are universal, equally good all types: a horseback riding, a pack, a meat and dairy. A key feature of the Kazakh breed horses is their endurance, which is necessary for life in the steppe expanses during heat in summer and frost in winter. This feature makes this horse suitable for sports tournaments as well, when endurance is more important than fastness of the animal. The list of "Zhetі Kazyna" concludes with good weapons (saber for nomads, bow and arrows, "kamshy-pyshak" – a sharp blade which was hidden in the handle of the whip, etc. ), which will not fail in combat; and comprehensive knowledge that will help to go right through life and make wise decisions. ... Of course, today it is impossible for everyone to have a personal horse, a tazy dog, a golden eagle – a civilization, city life dictates their own rules and regulations. But there are guardians of these traditions! 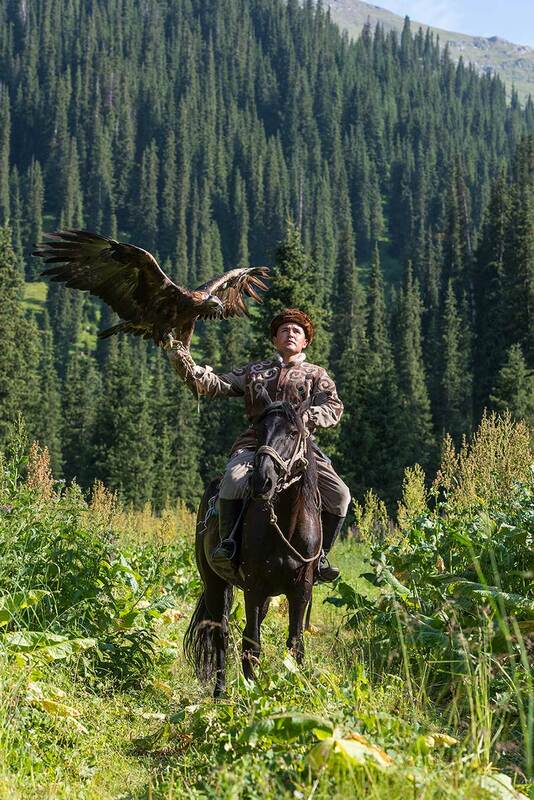 Most often it is hereditary berkutchi (a falconer), hereditary hunters and riders. 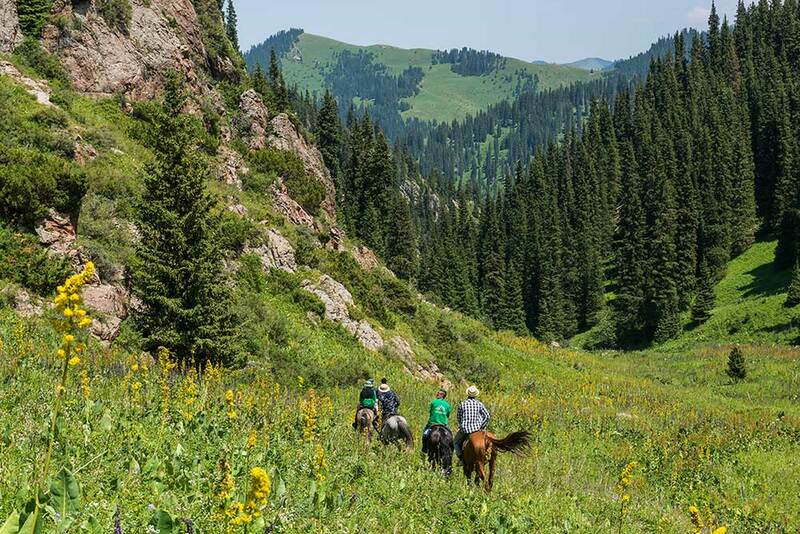 Owing to them and their initiatives, we have got the Association of National Sports in Kazakhstan, including hunting with hunting birds; various national events also happen upon their initiative – falconer festivals, ethnic festivals, art symposia, and sports where horses are inseparable part of national games like baiga, kokpar, kyz-kuu. Owing to such people, anyone can be tangent to the nomadic culture of Kazakh people. You only need to decide what activity is the closest to your heart and then you may start your trip!